The Chessie pups are hilarious when it comes to fun with water! They love the water coming out of the hose. And, unfortunately, they love the pond! Lilly and Lacy in particular go nuts over the water coming out of the hose and try their best to ‘catch’ that stream of water. In fact, we have to be careful so they don’t ‘drown’ themselves as they become so engrossed in their effort to lay that water beast to rest. But all of them will jump into the game off and on. I like this photo because the ball is suspended – the water can be seen falling from the bottom as well as splashing up and the pups are looking at the ball as if it is possessed! This was but a moment, and the pups were trying to get the ball. The pup with the red collar is Lacy. Lacy and Luca are both brown with the curly hair. Lilly, Libby and Lady are yellow – or Dead Grass, Light Dead Grass in Chessie lingo. Here is a nice photo of all five pups. They are really this attentive. It’s amazing. They are all looking up at the ball waiting for it to be thrown. Of course, once the ball is thrown, some go after it, some do not. It’s a really hot day: mid-90’s and humid. We took these photos between thunderstorms. Storms that took out much of the electricity in our region, storms that packed a punch. So, the dogs are hot and a bit weary. Here is another photo of them with the water coming out of the hose. The pups come when called and are all around great pups. 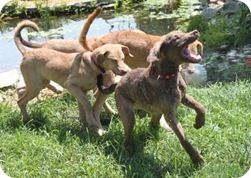 They are Chesapeake Bay Retrievers so those interested in owning one will want to read about the breed. Donate a Kuranda Bed! Learn more now! Our dogs love Kuranda Beds!